We all have our favorite art styles. This site obviously focuses on my undying lust for fighter-style sprites, but at the same time, I’m so comfortable with pixels today that I could work with any style — sonic, guilty gear, rpg, 8-bit, and so on. When you’ve got pixel art down, when you know how pixels naturally work, you’re free to work in any style that you want. Like how you could play any style of music once you’ve gotten truly comfortable with an instrument. Looking back, I went through a lot of stages on my road to self-taught spriting, and I feel like I lucked out in the order that I learned everything. So this post is a walkthrough for aspiring sprite hobbyists with my own personal suggestions for how to grow your pixel skills the most natural and effective way. This step probably goes without saying, since most likely you already have a favorite style (What else is there that could motivate you to learn how to waste hours pixeling?). But it’s important to pick one style to focus on at the beginning so that you don’t get distracted with the techniques and rendering conventions of other styles. 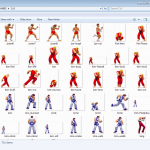 Get absolutely as many rips and animated GIFs of the sprites from your target game(s) as possible, and store them in a library on your hard drive. Visit sprite ripping sites and even try ripping your own if you can’t find enough elsewhere. If the style you like is from one specific game, see if the company that made that game made others in a similar style. By having all these sprites, you’ll not only have lots of artwork to browse through and learn from, but you’ll have a place to go for answers and inspiration if you get stuck while trying something new. And as a side bonus, if you have all of a character’s frames, you might even begin to pick up the basics of animation along the way through osmosis. MONITOR: To really see what you’re doing and what effects your pixels are having on the screen, you need to get up close and personal. 64-inch widescreen monitors aren’t going to help much when you have to strain your eyes to make sure a 100% size sprite is blending its outlines together right. The ideal display to build from is in my opinion a regular 13 or 15-inch LCD laptop monitor, at 800×600 resolution, where unmagnified pixels are free to blend together like normal without causing you eyestrain. And don’t forget to calibrate those colors. 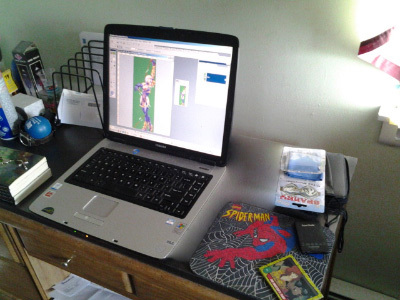 SOFTWARE: I began pushing my first pixels on now-defunct programs called GIF Animato and GIF Movie Gear. Today you have better options. I don’t recommend MS Paint because it doesn’t handle color selection too well from what I remember. Instead, try Photoshop or its freeware alternatives GIMP or Paint.net. Working with layers for sprites is something that takes getting used to, but the freedom you get, for example to make tentative corrections or additions, will quickly become indispensable. There she is folks, the place I’ve been sitting to make it all happen. And I’m still glasses-free to this day. Start small. Give a character a new outfit or change the direction of the lighting. Try making color changes to learn how much contrast is needed for good shading. There really is no more natural a way to observe how pixels work and pick up your game’s style than by getting in up close, making minor changes, and then zooming back out and figuring out if those changes work and if not, why. Don’t change the poses or do anything where you have to worry about anatomy; just stick with minor rendering changes to ease your brain in. Treat these art exercises for your mind like aspiring athletes treat exercises for their bodies — start small so you don’t overwhelm your brain, then increase the challenge level as your brain learns what good pixeling feels like. Most importantly, as with all these steps, take the time to absorb what you’re doing and ingrain what good pixel placement looks like into your mind, and don’t rush through trying to get instant results. Take time with this step. Like, a few months’ worth. Frankensprite. Verb. 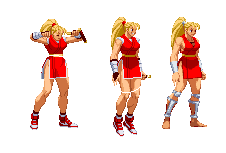 Definition: the art of clipping a body part of one sprite and adding it to to another sprite to make a new pose. Applies mainly to larger style sprites. 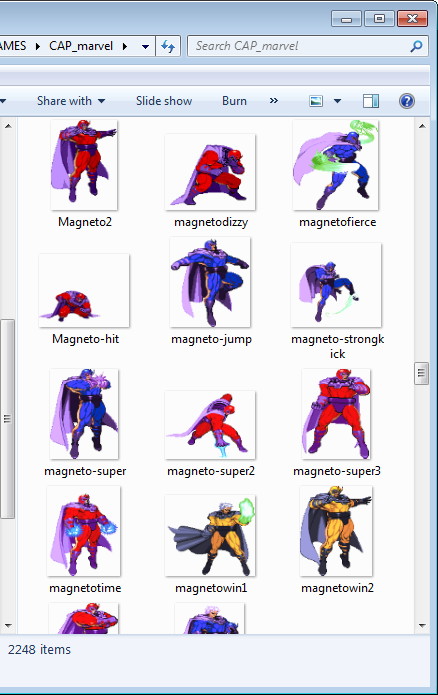 Example: giving Guile legs from Cyclops and recoloring him to look like Lion-O. This is the stage where you take on bigger edit jobs and get more satisfying results with more variety. 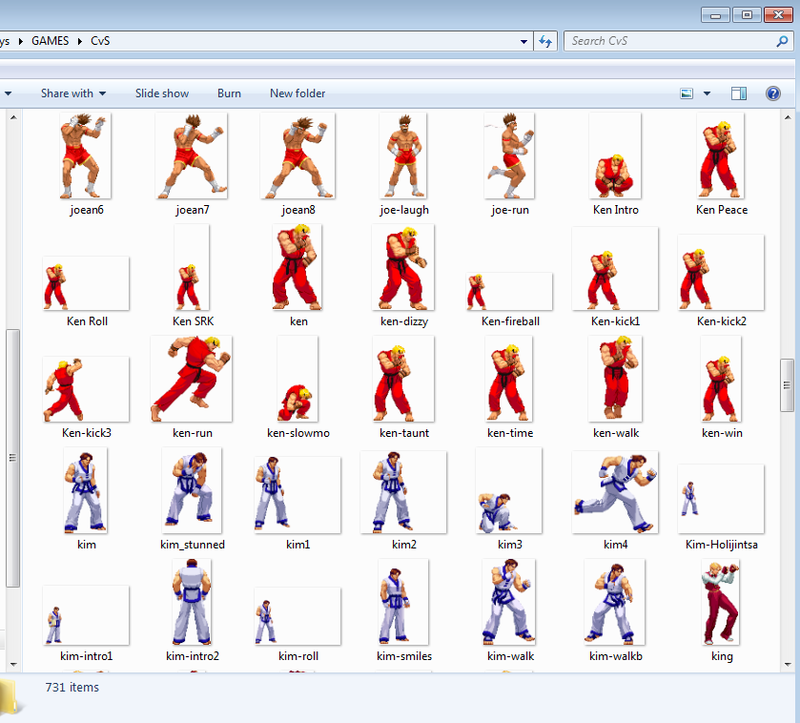 It’s also where having a large library of sprites will come in very handy by giving you more material to work from. It also requires more ‘regular art’ skills, such as knowing when an arm’s too long or isn’t twisting in a believable way, so be ready for a challenge increase. This step will reinforce what you’ve learned so far and add to those skills naturally by having you make new additions “look right.” Be a perfectionist here and take your time. Spend another few months on this stage and make some interesting combinations or some fake game screenshots. STEP 6: Convert sprites from a similar style to your target style. Time to step things up a bit and also test how well you’ve got things down. Is your sprite style 16-bit Sonic? Take a Megaman 7 sprite and turn it into a Sonic enemy. Chrono Trigger sprite? Take an overhead Final Fantasy sprite and make it join the cast. Capcom vs SNK fighter? 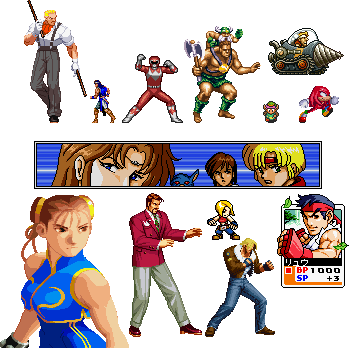 Take an SNK sprite and reshade/resize it to match. See if you can make the styles indistinguishable, in colors, shading, proportion, outlining, and so on. By now you should feel familiar with professional pixel tricks like anti-aliasing and outlining, and this step will slowly and naturally introduce you to different ways to use these techniques in different styles. STEP 7: Convert full-size artwork to your target style. It’s time to go out into the wild and take the leap from ‘pixels to pixels’ conversions to ‘art to pixels’. If there’s a screenshot from a cartoon or an illustration of your character in a good pose that you can get into Photoshop, grab it. Shrink it down to the right size and proportion, pixel over it on another layer and try to get it to match. This will be the final test of your pixel rendering skills, and you might not get the best results the first time. Faces, hands and finer details may throw you for a loop. That’s okay. It’ll get you to go back and discover what about those areas are so challenging, and help you iron out any skills you might have missed along the way. TIP: If you ever have trouble figuring out how to sprite something and you can’t find an answer from your hopefully massive sprite library, find or take a digital photo of it (or draw it or find full sized artwork of it) and shrink it down to see how it would be pixelated by Photoshop. Once you can do this convincingly, you’ll at last have true artistic freedom. You’ll be able to pixel your own drawings, and if it suits you, you’ll be comfortable enough with pixels that you can even start pixeling without working from a base drawing. The other important trait you’ll have picked up is patience. Pixeling should by now be a slow, soothing process that you don’t feel the need to rush through. 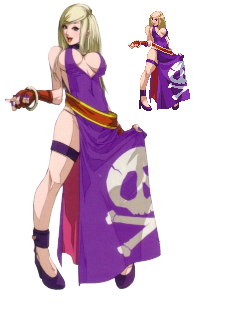 In fact, you’ll know you’re in a good place mentally when during your spriting projects you find yourself stopping for long periods of time to decide on the best placement of 1 or 2 pixels. Why Falcoon, your shading style is *exactly* what I’ve been looking for..
And.. well, Tekken 4, your shading is a little less of what I was looking for. Guess what! No problem! EXTRA CREDIT: Convert digital photographs of people to your target style. For less exaggerated styles like sidescrollers and fighters, try going the extra distance and throw your brain a curveball. Find a photo of a person and convert them into your style. Believe me, you’ll need every trick you have to get an unstylized figure into a fake screenshot. You’ll have to cartoon-ize not just the proportions but the face, the clothes, even the lighting. You’ll even have to add your own linework. But if you can pull that off — if you can turn a photo into a convincing pixel cartoon and make it look like they were drawn in that style — you’re at the level where you can do essentially anything with pixels. So there you have a rundown of the path I encourage beginners to take. Go forth and pixel with this overview of the route, but be sure to spread your art skills into more than one area at the same time. The final lesson you’ll learn about spriting is that these sharp, blocky pixels are more versatile than you think. Practice drawing and learn other art rules and techniques. You have to be a good artist to make good pixels, and the extra knowledge you pick up on the side will have opportunities to show up in your sprites. This lets you be free to eventually create something that’s truly yours. We all have our favorite art styles, and the nice thing is, they can inspire us to discover our own. See I don’t know how translatable my favourite style of pixelart to make it useful for games other than visual novels. I’m talking about the PC-98 Visual Novels, like Policenauts in particular. Usually pretty hi-res, lots of dithering etc. Not very useful for a sidescroller character like I’m working on now! Policenauts may not be practical for sprites or animations, but that would make pretty killer cutscenes for sidescroller games. Definitely a style you don’t see much of today. That’s a good point. Hadn’t thought of it like that! lol you got that right there.